Weddings are dreamy affairs. Only for the bride and the groom! The rest of the crowd is just fulfilling their duties and thinking of the food. For them it is a “foody” event. 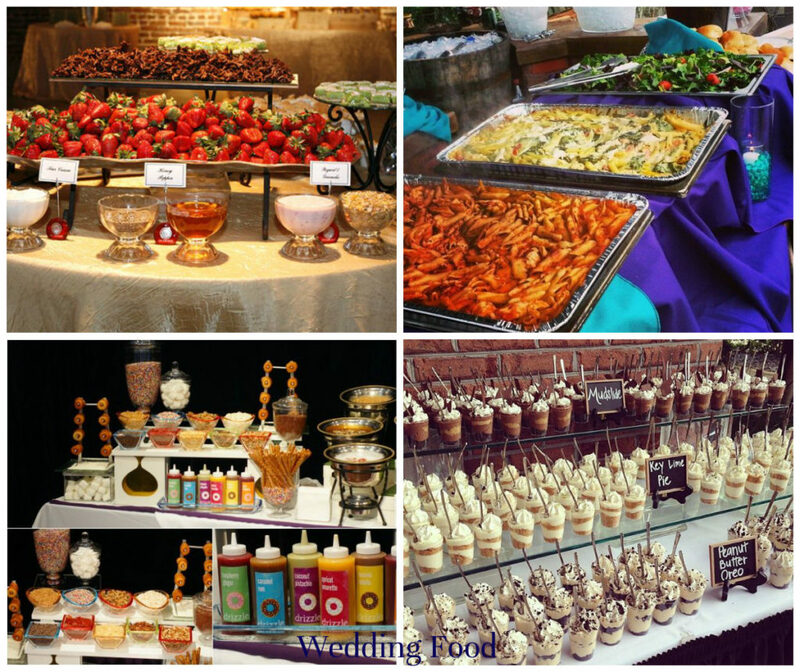 And it is only the food that retains long after the weddings are done with. Facing this truth, if you want to make a mark in the tongue and heart of the guest, here is how you can play smart. Think beyond the pastry box. Try putting in cronuts, the newest dessert hybrid sensation. These are flaky, buttery confections created by New York Pastry chef, Dominique Ansel. Half-croissant, half-delicious these treats come to make 100% delicious snacks. As hard as they are to get their hands on, the more will your guests go gaga on them. Mostly mini-versions of full-sized meals come to make a better statement, than their full-sized counterparts. A single meatball is here topped with spaghetti and some sauce for one classic dish that can leave guests drooling. Make cocktail hours stress-free by serving them snacks on tooth-picks. Nibbling on the tidbits becomes extra easy without having to pluck it with a fork or hold a plate beneath. Home-cooked favorites can be instantly elevated when served in unexpected ways. Grilled cheese points served with dainty tomato soup shooters can be a distinction. Appeal to the lighter side of guests, by adding in a few delicious good-for-you options on the menu. A Baby-Greek salad is one mouth-watering appetizer that you can surely go with. Breakfast has always been a crowd-pleaser, so why not serve it at a wedding? A bacon cup complete with scrambled eggs is one elegant twist on a classic morning staple. Neither a hotdog nor a pizza is complete without a coke or squash. In the same way no menu is ever complete without a drink. For a wedding you can definitely try caviar with vodka. For a laid back affair you can surely try on sliders with a craft beer. Try an abundant buffet. It is one great way to ensure, everyone gets what they are looking for. It also makes way for an appetizing focal point. One tasty buffet option can be a station of cheese, with an array of strong and mild flavors together with different textures and made out of cow, goat and sheep milk. Add labels so guests know what exactly they are going into — bread, nuts or fruits. Want people to mingle and have fun? Try a DIY food station. For example, you can try an adult snow cone station, with crushed ice, cups, mojito, cosmo, margarita and peach daiquiri. Think shots are by gone? Think again. You can definitely try wedding-worthy sangria-inspired gelees infused with citrus flavors, making them delicious and elegant. Playing smart is always a great idea. Just keep a smart eye open for allergens and other controversial food. With this, we wish you plan a memorable banquet for your guests.